With Washington in turmoil over a U.S. Supreme Court nominee who suddenly finds his Senate confirmation in trouble after allegations of sexual misconduct, D.C. Del. Eleanor Holmes Norton sees a version of history repeating itself. WASHINGTON — With Washington in turmoil over a Supreme Court nominee who suddenly finds his Senate confirmation in trouble after allegations of sexual misconduct, D.C. Del. Eleanor Holmes Norton sees a version of history repeating itself. In 1991, Clarence Thomas was heading toward what appeared to be a fairly straightforward confirmation vote to replace Thurgood Marshall on the nation’s high court. But, the nomination process was quickly upended when the allegations of Anita Hill, an attorney from Oklahoma, became public. She accused Thomas of sexual harassment in the workplace when he was her supervisor; he categorically denied her account. Hearings on Capitol Hill over the matter went on to became a cultural spectacle. Norton worked closely with other lawmakers to help Hill testify. But, she believes there are important differences between that case and the allegations raised by Christine Blasey Ford against President Donald Trump’s nominee, Brett Kavanaugh. “This is far more serious than the accusation against Clarence Thomas,” Norton said of Ford’s accusation that Kavanaugh sexually assaulted her during a high school party in the early 1980s. Ford has said Kavanaugh was drunk and that he jumped on her and tried to pull off her clothes at the party. Kavanaugh has vehemently denied the allegation and vowed to rebut it at a hearing scheduled for next Monday before the Senate Judiciary Committee. It was still unclear on Wednesday whether Ford will testify at that hearing, following her lawyers’ request that the FBI investigate her allegation before she speaks to lawmakers. 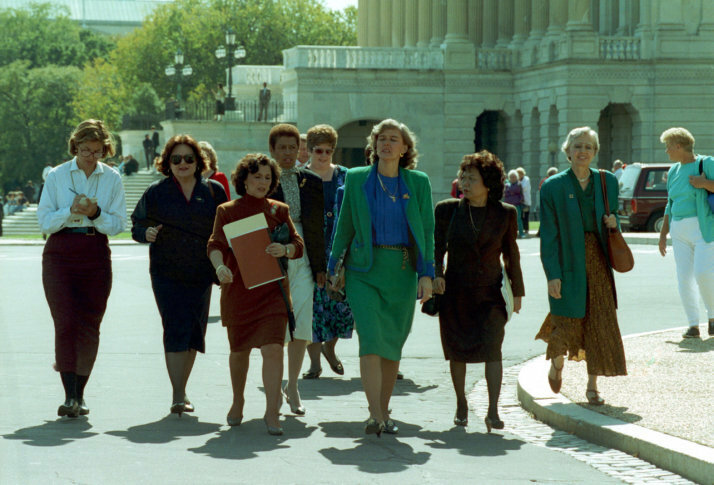 In 1991, Norton was one of seven women in Congress who became so upset with what they saw happening to Hill that they marched from the House side of the Capitol to the Senate to try to meet with the powerful men controlling the confirmation hearings. Though the group was initially rebuffed, Norton said she believes the efforts helped Hill be able to tell her story. “Remember, the Democrats were in charge,” she said. “They had to learn that you’ve got to give a hearing at least, so they’ve learned that much,” Norton said in an interview at her Rayburn House office. The chairman of the Senate Judiciary Committee at the time was Democratic Sen. Joe Biden, of Delaware. Republicans currently control the committee. If Ford goes ahead with testifying before lawmakers, Norton said her advice would be to go back and watch Hill’s testimony from 27 years ago. “You will understand exactly what you have to do. That’s just how perfect her testimony was before the Senate,” Norton said. Whatever happens moving forward, the current confirmation hearings will likely have political implications. Supporters of the #MeToo movement believe it’s an important test for political leaders. Norton pointed out that women had strong turnout at the polls in 1992, the year after the Thomas confirmation hearings. “That turned out to be the Year of the Woman … and we got more women than we had ever had in the Senate,” she said. In 1992, 24 women were elected to the House of Representatives; four were elected to the Senate. One of those elected was Democratic Sen. Dianne Feinstein, of California, now the ranking Democrat on the Senate Judiciary Committee. She has been criticized by Republicans for not coming forward earlier with information about Ford’s allegations against Kavanaugh. Feinstein has defended herself, noting that Ford had initially asked to keep the allegations confidential. Republicans are still counting on the Senate to confirm Kavanaugh and provide Trump with a second successful nomination to the U.S. Supreme Court. Justice Neil Gorsuch was confirmed last year.